We were surprised and delighted to see new London Mayor Boris Johnson honour his manifesto pledge to scrap planned changes to the Congestion Charge. Deposed car-hater Ken Livingstone’s scheme for stinging owners of large cars was to have been sweetened by free entry for Band B cars, a piece of political hokey-cokey that, as a by-product, would have killed off the UK’s nascent electric car industry. Johnson’s move, coupled with Gordon Brown’s recent posturing over cleaner motoring, makes it seem safe to put money into electric horseless carriages after all. Meanwhile, we were equally delighted by the gallery of pictures posted by Gordon Murray Design, following its recent first anniversary party. 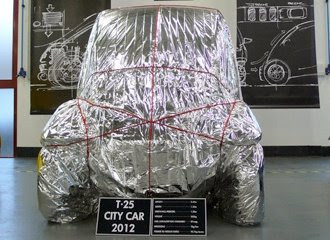 Snaps of the gift-wrapped T.25 city car give a much clearer indication of the underlying shape than the ill-lit effort we lifted from Car Magazine in our last post. We concede that Murray's midget almost certainly will be a conventionally arranged four-seater, contrary to speculation in our last missive. Images of the front of the foil-wrapped car show that the proportions probably will cope with normal two-abreast seating. It’s going to be a squeeze, though. Not a car for the clinically obese, we feel. We hope that the finished T.25 will be less annoying than the Gordon Murray Design home page, where visitors have no choice but to sit through a pointless 20-second opening sequence before they can get to any actual content. We visited the site three times before remembering to bookmark the useful pages, and that’s a whole minute of our lives we’ll never get back. Good design? No.